Apply for these positions by clicking the link, through the BHR website. As a Department, our focus is to serve South Dakotans and support governement services by collecting all taxes required by law, support motor vehicle requirements, and regulating the gaming industry and state's lottery to raise revenue for goverment programs. Come join the DOR team! South Dakota Retailers held a Business Boot Camp on Tuesday, January 14. DOR participated by having a booth to answer questions people may have about the Collection Allowance and EPath and to help people sign up for EPath. One business requested a license review. Check out the January 2014 DOR E-News! Here's a sneek peak, read more stories, click the E-News link. Wessington is increasing its 1 percent general sales and use tax rate to 2 percent. Pukwana is imposing a 2 percent general sales and use tax rate. Mellette is imposing a 2 percent general sales and use tax rate. New Effington is imposing a 2 percent general sales and use tax rate. 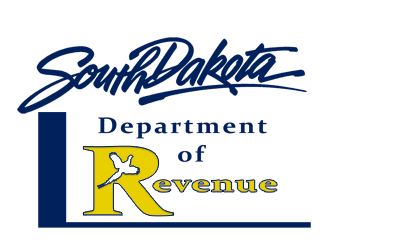 The South Dakota Department of Revenue has Municipal Tax Information Bulletins available listing all municipal sales and use tax rates statewide as well as information on tribal sales, use and excise taxes. Updated bulletins are free of charge and available after Jan. 1, 2014, by contacting the Department of Revenue at 800-829-9188 or by downloading a copy from the Department’s website by selecting “Municipal Tax Changes” in the “LEARN ABOUT” section of the webpage. DOR is pleased to announce that Investigative Services Bureau Special Agent Darrell Halse has been awarded Certified Fraud Examiner (CFE) credential from the Association of Certified Fraud Examiners (ACFE). In order to become a CFE, Special Agent Halse had to meet a stringent set of criteria and pass a rigorous exam administered by the ACFE. "Special Agent Halse has completed all the requirements for the CFE credential through hard work and determination," stated Andy Fergel, chief legal counsel for the department. "The knowledge he gained and the training he received will be beneficial to the department’s tax compliance efforts in investigating tax fraud." Halse has successfully met the ACFE’s character, experience and education requirements for the CFE credential, and has demonstrated knowledge in four areas critical to the fight against fraud: fraudulent financial transactions, fraud prevention and deterrence, legal elements of fraud and fraud investigation. Halse has been a special agent with the Department of Revenue’s Investigative Services Bureau for nine years. What are the rules around Snow Removal? South Dakota's sales and use tax applies to all services unless state law specifically exempts the service. Gross receipts resulting from snow removal services are subject to sales tax. When snow removal is provided for and paid by a governmental entity, such as a county or township, the receipts are not taxable. If you charge for snow removal and have a contractors' excise tax license, you may report snow removal receipts on your contractors' excise tax return on the Net Sales or Use Taxable line. If you do not have a tax license, apply for a sales tax license online. Any person performing snow removal on public roads must also have a highway contractors' license. "Public highways or roads" are any way or place, including waterways and snowmobile trailes, open to the use of the public for vehicular, snowmobile or watercraft travel. This definition includes those ways or places temporarily closed for construction, recontruction, maintenance or repair. For more information on Contractors' Excise Tax, download our Contractors' Exicse Tax guide.